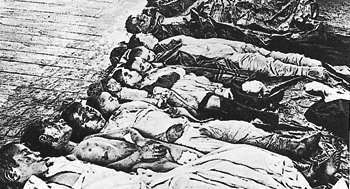 Photo believed to show the victims, mostly Jewish children, of a 1905 pogrom in Yekaterinoslav (today's Dnipropetrovsk). The term "pogrom" in the meaning of large-scale, targeted, and repeated anti-Jewish rioting, saw its first use in the 19th century, in reference to the anti-Jewish pogroms in the Russian Empire. Pogroms began occurring after the Russian Empire, which previously had very few Jews, acquired territories with large Jewish populations during 1791-1835. These territories were designated "the Pale of Settlement" by the Russian government, within which Jews were reluctantly permitted to live, and it was within them that the pogroms largely took place. Most Jews were forbidden from moving to other parts of the Empire, unless they converted to the Russian Orthodox state religion. The first pogrom is sometimes considered to be the 1821 Odessa pogroms after the execution of the Greek Orthodox patriarch Gregory V in Constantinople, in which 14 Jews were killed. The initiators of the 1821 pogroms were the local Greeks, who used to have a substantial diaspora in the port cities of what was known as Novorossiya. Some sources consider the first pogrom to be the 1859 riots in Odessa. The term "pogrom" became commonly used in English after a large-scale wave of anti-Jewish riots swept through south-western Imperial Russia (present-day Ukraine and Poland) from 1881 to 1884 (in that period over 200 anti-Jewish events occurred in the Russian Empire, notably the Kiev, Warsaw and Odessa pogroms). The trigger for these pogroms was the assassination of Tsar Alexander II, for which some blamed "the Jews". The extent to which the Russian press was responsible for encouraging perceptions of the assassination as a Jewish act has been disputed. Local economic conditions (such as ancestral debts owed to moneylenders) are thought to have contributed significantly to the rioting, especially with regard to the participation of the business competitors of local Jews and the participation of railroad workers. It has been argued that this was actually more important than rumours of Jewish responsibility for the death of the Tsar. These rumours, however, were clearly of some importance, if only as a trigger, and they drew upon a small kernel of truth: one of the close associates of the assassins, Gesya Gelfman, was born into a Jewish home. The fact that the other assassins were all atheists and that the wider Jewish community had nothing to do with the assassination had little impact on the spread of such antisemitic rumours. Nonetheless, the assassination inspired "retaliatory" attacks on Jewish communities. During these pogroms thousands of Jewish homes were destroyed, many families were reduced to poverty, and large numbers of men, women, and children were injured in 166 towns in the southwest provinces of the Empire such as Ukraine. There also was a large pogrom on the night of 15–16 April 1881 (the day of Eastern Orthodox Easter) in the city of Yelizavetgrad (now Kropyvnytskyi). On April 17 the Army units were dispatched and were forced to use firearms to extinguish the riot. However, that only incited the whole situation in the region and a week later series of pogroms rolled through parts of the Kherson Governorate. On April 26, 1881 even bigger disorder engulfed the city of Kiev. The Kiev pogrom of 1881 is considered the worst one that took place in 1881. The pogroms of 1881 did not stop then. They continued on through the summer, spreading across a big territory of modern-day Ukraine: (Podolie Governorate, Volyn Governorate, Chernigov Governorate, Yekaterinoslav Governorate, and others). During these pogroms the first local Jewish self-defense organizations started to form, the most prominent one in Odessa. It was organized by the Jewish students of the Novorossiysk University. The new Tsar Alexander III initially blamed revolutionaries and the Jews themselves for the riots and in May 1882 issued the May Laws, a series of harsh restrictions on Jews. The pogroms continued for more than three years and were thought to have benefited from at least the tacit support of the authorities, although there were also attempts by the Russian government to end the rioting. The pogroms and the official reaction to them led many Russian Jews to reassess their perceptions of their status within the Russian Empire, and so to significant Jewish emigration, mostly to the United States. These pogroms were referred to among Jews as the 'storms in the negev', negev being a Biblical word for the south. Changed perceptions among Russian Jews also indirectly gave a significant boost to the early Zionist movement. At least 40 Jews were killed during pogroms during April to December 1881. Of these, 17 were reportedly killed while being raped. An additional 225 incidents of Jewish women being raped were reported. The leaders of the Jewish community in London were slow to speak out. It was only after Louisa Goldsmid's support following leadership from an anonymous writer named "Juriscontalus" and the editor of the Jewish Chronicle that action was taken in 1881. Public meetings were held across the country and Jewish and Christian leaders in Britain spoke out against the atrocities. A much bloodier wave of pogroms broke out from 1903 to 1906, leaving an estimated 2,000 Jews dead and many more wounded, as the Jews took to arms to defend their families and property from the attackers. The 1905 pogrom against Jews in Odessa was the most serious pogrom of the period, with reports of up to 2,500 Jews killed. Home at last by Moshe Maimon. The house's occupants return when it is safe, to find the house thoroughly looted. A rabbi is saying Kaddish for a member of the household who was killed. "The anti-Jewish riots in Kishinev, Bessarabia [modern Moldova], are worse than the censor will permit to publish. There was a well laid-out plan for the general massacre of Jews on the day following the Orthodox Easter. The mob was led by priests, and the general cry, "Kill the Jews", was taken up all over the city. The Jews were taken wholly unaware and were slaughtered like sheep. The dead number 120 [Note: the actual number of dead was 47–48] and the injured about 500. The scenes of horror attending this massacre are beyond description. Babies were literally torn to pieces by the frenzied and bloodthirsty mob. The local police made no attempt to check the reign of terror. At sunset the streets were piled with corpses and wounded. Those who could make their escape fled in terror, and the city is now practically deserted of Jews." This series of pogroms affected 64 towns (including Odessa, Yekaterinoslav, Kiev, Kishinev, Simferopol, Romny, Kremenchug, Nikolayev, Chernigov, Kamenets-Podolski, Yelizavetgrad), and 626 small towns (Russian: городок) and villages, mostly in Ukraine and Bessarabia. Historians such as Edward Radzinsky suggest that many pogroms were incited by authorities, even if some happened spontaneously, supported by the Tsarist Russian secret police (the Okhrana). Those perpetrators who were prosecuted usually received clemency by Tsar's decree. Even outside these main outbreaks, pogroms remained common; there was an anti-Jewish riot in Odessa in 1905 in which thousands were killed in total. The 1903 Kishinev pogrom, also known as the Kishinev Massacre, in present-day Moldova killed 47–49 persons. It provoked an international outcry after it was publicized by The Times and The New York Times. There was a second, smaller Kishinev pogrom in 1905. A pogrom on July 20, 1905, in Yekaterinoslav (present-day Dnipro, Ukraine), was stopped by the Jewish self-defense group (one man in the group killed). On July 31, 1905, there was the first pogrom outside the Pale of Settlement, in the town of Makariev (near Nizhni Novgorod), where a patriotic procession led by the mayor turned violent. At a pogrom in Kerch in Crimea on 31 July 1905, the mayor ordered the police to fire at the self-defence group, and two fighters were killed (one of them, P. Kirilenko, was a Ukrainian who joined the Jewish defence group). The pogrom was conducted by the port workers apparently brought in for the purpose. After the publication of the Tsar's Manifesto of October 17, 1905, pogroms erupted in 660 towns mainly in the present-day Ukraine, in the Southern and Southeastern areas of the Pale of Settlement. In contrast, there were no pogroms either in present-day Poland or Lithuania. There were also very few incidents in Belarus or Russia proper. There were 24 pogroms outside of the Pale of Settlement, but those were directed at the revolutionaries rather than Jews. The greatest number of pogroms were registered in the Chernigov gubernia in northern Ukraine. The pogroms there in October 1905 took 800 Jewish lives, the material damages estimated at 70,000,000 rubles. 400 were killed in Odessa, over 150 in Rostov-on-Don, 67 in Yekaterinoslav, 54 in Minsk, 30 in Simferopol—over 40, in Orsha—over 30. In 1906, the pogroms continued: January — in Gomel, June — in Belostok (ca. 80 dead), in August — in Siedlce (ca. 30 dead). The police and the military personnel were among the perpetrators. In many of these incidents the most prominent participants were railway workers, industrial workers, and small shopkeepers and craftsmen, and (if the town was a river port (e.g. Dnipro) or a seaport (e.g. Kerch)), waterfront workmen; peasants mainly joined in to loot. The pogroms are generally thought to have been either organized or at least condoned by the authorities. This view was challenged by Hans Rogger, I. Michael Aronson and John Klier, who couldn't find such sanctions documented in the state archives. However, the antisemitic policy that was carried out from 1881 to 1917 made them possible. Official persecution and harassment of Jews influenced numerous antisemites to presume that their violence was legitimate, and this sentiment was reinforced by the active participation of a few high and many minor officials in fomenting attacks, as well as by the reluctance of the government to stop pogroms and to punish those responsible for them. The pogroms of the 1880s caused a worldwide outcry and, along with harsh laws, propelled mass Jewish emigration. Two million Jews fled the Russian Empire between 1880 and 1914, with many going to the United Kingdom and United States. In reaction to the pogroms and other oppressions of the Tsarist period, Jews increasingly became politically active. Jewish participation in The General Jewish Labor Bund, colloquially known as The Bund, and in the Bolshevik movements, was directly influenced by the pogroms. Similarly, the organization of Jewish self-defense leagues (which stopped the pogromists in certain areas during the second Kishinev pogrom), such as Hovevei Zion, led to a strong embrace of Zionism, especially by Russian Jews. In 1903, Hebrew poet Hayyim Nahman Bialik wrote the poem In the City of Slaughter in response to the Kishinev pogrom. Elie Wiesel's The Trial of God depicts Jews fleeing a pogrom and setting up a fictitious "trial of God" for His negligence in not assisting them against the bloodthirsty mobs. In the end, it turns out that the mysterious stranger who has argued as God's advocate is none other than Lucifer. The experience of a Russian Jew is also depicted in Elie Wiesel's The Testament. A pogrom is one of the central events in the play Fiddler on the Roof, which is adapted from Russian author Sholem Aleichem's Tevye the Dairyman stories. Aleichem writes about the pogroms in a story called "Lekh-Lekho". The famous Broadway musical and film Fiddler on the Roof showed the cruelty of the Russian pogroms on the Jews in Anatevka in the early 20th century. The novel The Sacrifice by Adele Wiseman also deals with a family that is displaced after a pogrom in their home country and who emigrate to Canada after losing two sons to the riot and barely surviving themselves. The loss and murder of the sons haunts the entire story. Mark Twain gives graphic descriptions of the Russian pogroms in Reflections on Religion, Part 3, published in 1906. Joseph Joffo describes the early history of his mother, a Jew in the Russia of Tsar Nicholas II, in the biographical 'Anna and her Orchestra'. He describes the raids by Cossacks on Jewish quarters and the eventual retribution inflicted by Anna's father and brothers on the Cossacks who murdered and burnt homes at the behest of the tsar. In Bernard Malamud's novel The Fixer, set in Czarist Russia around 1911, a Russian-Jewish handyman, Yakov Bog, is wrongly imprisoned for a most unlikely crime. It was later made into a film directed by John Frankenheimer with a screenplay by Dalton Trumbo. ↑ Odessa pogroms Archived January 21, 2007, at the Wayback Machine. at the Center of Jewish Self-Education "Moria". ↑ (Polish) Pogrom Archived February 6, 2010, at the Wayback Machine., based on Alina Cała, Hanna Węgrzynek, Gabriela Zalewska, "Historia i kultura Żydów polskich. Słownik", WSiP. ↑ Stephen M Berk, Year of Crisis, Year of Hope: Russian Jewry and the Pogroms of 1881–1882 (Greenwood, 1985), pp. 54–55. ↑ C. S. Monaco (2013). The Rise of Modern Jewish Politics: Extraordinary Movement. Routledge. pp. 148–. ISBN 978-0-415-65983-3. ↑ Nicholas II. Life and Death by Edward Radzinsky (Russian ed., 1997) p. 89. According to Radzinsky, Sergei Witte (appointed Chairman of the Russian Council of Ministers in 1905) remarked in his Memoirs that he found that some proclamations inciting pogroms were printed and distributed by Police. ↑ "декабрь 1907 - Газетные "старости"(Архив)". ↑ "CFCA - The Coordination Forum for Countering Antisemitism". ↑ "Archived copy". Archived from the original on March 21, 2012. Retrieved December 13, 2012. ↑ "VIRTUAL KISHINEV - 1903 Pogrom". ↑ John Klier, Christians and Jews and the "dialogue of violence" in late Imperial Russia, 2002, p167, "Despite the most active search of the authorities, outside agitators and instigators were never found. The urban intelligentsia was rarely involved.... All contemporary descriptions of the pogroms depict them as anarchistic rebels, rather than ideological protests. For most of the participants, it seems the pogroms were a form of carnival, of role-reversal, of 'the world turned upside down'. Questions of status and respect seem to have played a role in the pogroms, where the participants (predominantly peasants, town proletariat, vagrants, migrant workers, demobilized soldiers and other unsettled elements) wanted to put the Jews 'in their place'." ↑ Sonja Weinberg, Pogroms and Riots: German Press Responses to Anti-Jewish Violence in Germany and Russia (1881–1882), Peter Lang, 2010, p. 210. ↑ "In the City of Slaughter". ↑ Sholem Aleichem. Tevye the Dairyman and the Railroad Stories. Schocken Books, Inc: 1987. p. 116–131. Jewish Virtual Library page "Pogroms"